hello my friend! Im writting you from el salvador...I just "discovered" the comet last nigth on my way home and was surprised to see a "Star" in Perseus that didnt belong to him! !My first thought was “boy!..is that a supernova!?? ?”…since no tail or coma was visible to the naked eye!…then i saw it throuhg my 4 inches newtonian telescope and there it was! !..that BEAUTIFUL comet!! Hello my friends abroad. Leave it to the beauty and wonder of the cosmos to unite us as a species. A lone wanderer makes a trip into our neighbourhood and puts on a show that delights an entire hemisphere. Regardless of political boundaries or ideologies, we’re all equally fascinated and reminded that the Universe is far from static and unchanging! I was able to share a fantastic view of the comet with my wife and children with a small Meade ETX60 complete with glaring full Moon. Better yet was the naked eye spectacle of seeing the comet without any effort whatsoever. Oct 26 I was able to image the comet with my 10″ LX200GPS and CCD. WOW! Even though there are no signs of a tail, I could detect some structure in the nucleus and surroung coma. 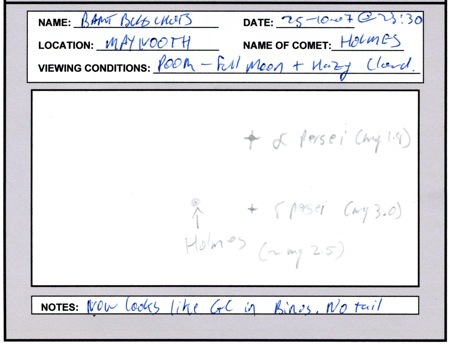 Lets hope comet 17/P Holmes continues to put on a show for a while. Thanks very much for your wonderful comments. It really is great to see people from all over the world united by our love of the heavens. Greetings from the Sonoran Desert! I finally viewed this comet this evening through my amateur level Meade telescope from my back-yard. I found it strikingly easy to locate thanks to it getting larger. Treats like this are rare and should leave us to ponder the grand design. I’ve been out watching the beautiful Comet 17/P Holmes the past three nights from here in Toledo, Ohio, USA with my 10X50 binouculars but I am sure having problems trying to get a picture of it. It just does’nt seem bright enough for me to find. I’m using a Minolta SLR 35mm camera and a 500mm telephoto lens, and a 135mm lens and plain can’t find it. My 10 year old Grandson is enjoying it with ne though. I’m not much of an expert on photography but the guys over at http://www.irishastronomy.org are. They are a really friendly bunch and there’s a lot of guys in there with a lot of experience when it comes to taking pictures of things at night. Glad your Grandson is getting enjoyment out of the great comet too. Hello, i heard of this comet on the german news, looked on the net for it’s location. at 800asa and 30 seconds it gave a very beautifull and well exposed picture of this comet. i hope the skies clear up for the days to come, it was terrible last week.